Vertical gardens offer a creative, new way to display your house plants. You have more choices than ever to create an indoor vertical garden. Put a few together and you've got an eye-catching garden for your wall. 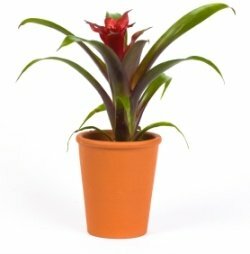 When choosing plants for your wall garden, it's a good idea to use easy-to-grow tropicals. Choose plants that like the same growing conditions. Many popular tropical house plants prefer indirect sunlight and lightly moist soil, so it's not difficult to find a few compatible plants. Why not ditch the dirt and grow beautiful tropicals in glass hanging planters as shown at left. Arrowhead plant (shown here), chinese evergreen or pothos will grow in water. This is a good spot for propagating your houseplants. Take a few cuttings and make a display of them. Keep it simple. Crowding too many plants in one arrangement doesn't allow any of them to stand out. Plus, you want to give them room to grow. Variegated leaves add some interest and contrast. Be sure to add in a trailing plant such as pothos or heartleaf philodendron. The indoor wall planter (at right) is one of the easiest systems I've seen for achieving lush vertical gardens indoors. Three galvanized steel pots are attached to a chalkboard back for labeling your plants or herbs. Just slip plastic liners (included) inside the pots. Display them side by side for a chic living wall garden. Give your air plants (Tillandsias) a new home on the wall. This is about the easiest wall "planter" you'll find anywhere. And the most versatile. Use a variety of air plants (not included) to make your own framed work of art. This unique wall decor is sure to get attention...and compliments from all who see it. Give your plants light. Most tropicals require a few hours of indirect sunlight every day. Put your garden on a wall near a window. 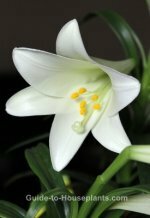 Fluorescent lighting will also give plants the light they need to grow. Water regularly. Give plants a good drink then allow the potting mix to dry out a bit before watering again. Avoid overwatering...you don't want water overflowing on your floor. Pinch and prune. Keep plants within bounds by pinching off growing tips. Also cut off any brown leaves as soon as you notice them. Dead or dying leaves are more conspicuous when they're at eye-level. Watch your wall come alive with the Wine Crate Vertical Garden . Keep your garden growing all year on a sunny wall. Use a variety of herbs or tropicals for an eye-catching display. Made from a weathered wine crate, it's a charming way to transform your indoor garden into a work of art you'll enjoy for many years. Just slip up to 9 4-inch potted plants into the crate. No repotting needed! Green up a sunny wall with this trio of Copper-Tone Hanging Planters (shown at right). Slip beautiful succulents into these metallic-coated ceramic pots. Then, just hang them up and they're practically maintenance-free. Wherever you hang your vertical garden, you'll transform a sun-splashed wall into a stunning garden showplace.